As the first rains usher us into the winter holiday of Hanukkah, I feel surrounded by everyday miracles in my community in Ramat Eshkol. The lights have returned to local residential buildings, the “Warm Room” is flourishing, and our urban regeneration project is on the verge of being signed into reality. In the following sections you will learn about a small fraction of our activities-updates regarding our ongoing efforts to further contribute to the area’s urban renewal, economic development endeavors, and women’s empowerment through education. The Hanukkah story teaches us about how a small but impassioned group succeeded in creating change through dedication and perseverance. I believe that grassroots social change is driven by the same set of values. Our work in Ramat Eshkol has taught me that a common vision is infinitely powerful in driving a small community to change the world around them. As you read and share your holiday story with your family and friends this year, I encourage you to contemplate how you can inspire change in your community. We need your help to extend Jindas' many commitments to the local community. Your contribution today will maintain the "Warm Room" activity now able to serve an even greater number of families in need, enhance Jindas collaboration with residents, the Lod "Chicago" Multicultural Center, and key stakeholders bringing positive change to our immediate area. With many thanks for your generous support, wishing you happy holidays. Want to receive updates on all of Jindas's work and events? On November 30th, just before the holidays, the lights were finally turned on in the Hashmonaim complex in Ramat Eshkol neighborhood. After almost 30 years of dark corridors, broken bulbs, and unlit staircases, Hashmonaim residents came home to a welcoming, warmly lit building. Turning the lights back on was an important part of a much larger renovation project aimed at renovating and beautifying all of the shared public spaces in the Ramat Eshkol neighborhood. Renovating the three buildings was a lengthy, intensive process. The project occurred in stages, beginning with the theoretical and continuing to the practical. 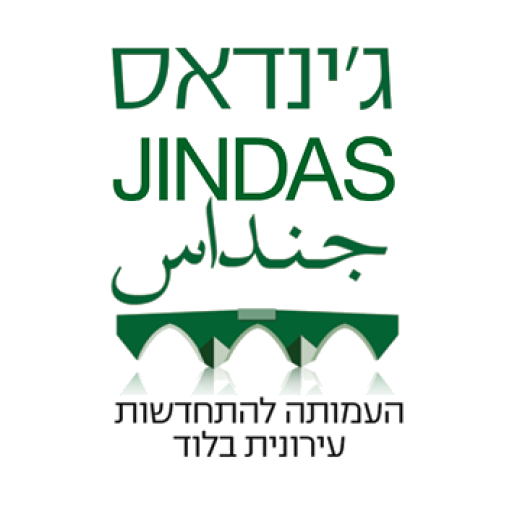 Firstly, Jindas partnered with the Chicago Community Center to secure a donation from Nesher, the local cement factory, in order to fund the project. Nesher’s enthusiastic and gracious investment in its community jump started the renovation project. Next, a series of lectures were organized for all the residents of the Hashmonaim complex. Once a month over the course of a year, all the residents came together and learned about housing committees, conflicts solving and the dynamics of maintaining a shared space. These lectures were integral to building a feeling of communal investment in the shared spaces of the buildings. The second stage involved the physical renovation; local builders, carpenters, and electricians came together to rewire the old buildings. Floor by floor, electrical lines were fixed, bulbs were repaired, and broken glass was replaced. Finally, the buildings and the community was ready for November 30th’s joyous ceremony. Over two hundred residents of forty-eight apartments in three buildings came together to celebrate turning on the lights. Families rejoiced, children clapped; it was clear to all present that the lights served not only as a practical renovation but also as a symbolic entrance into a new era of urban regeneration for Ramat Eshkol. An afternoon stroll through Ramat Eshkol illustrates​ ​something striking-almost everyone out and about are women. Women are nurturing children, running errands on the street, leading workshops and teaching programs at the local community center. In terms of visibility, they appear as the backbone of this tough but tight knit neighborhood. In a way, this shouldn’t come as a surprise; the majority of the families reflect traditional gender roles-men go to work, women maintain the household and raise the family. Although this traditional role has its challenges, it also provides local women with a unique insight into community dynamics that allows them to drive grassroots social change. However, the women of Ramat Eshkol have not been able to utilize this powerful role to their full advantage. Throughout the last couple decades, a combination of a lack of resources and societal pressures meant that many women did not finish their high school degrees, thus restricting their ability to advance themselves. Jindas recognized the serious educational disparity, and in partnership with local community leaders, established a GED program for women in the community. The goal of the program is to provide the women an invaluable educational certificate, improve their skills for the workplace, and foster a stable learning environment. Graduates of the program are encouraged to come back as mentors to new participants and help other women find their niches in the local economy. Therefore, over the last year, a group of ambitious, talented women came to the Chicago Community Center every day to learn and finish their high school diplomas. Many of the women have the added pressure of being young mothers and part-time workers, but the results of the course have been extraordinary. The group’s grades on national exams have surpassed all expectations, but even more importantly, the enthusiasm and love for learning that pours out of their classroom illustrates the true potential of these exceptionally talented women. The Old City of Lod is a bustling marketplace that seamlessly emerges from the historic ruins that characterize the distinctiveness of the city center. Interestingly, many businesses, such as tailor shops, fashion stores, and beauty parlors, are run by local women. To face the daily challenges of being a female business woman in a traditional society, these women possess exceptional skills and strengths. Jindas has established a forum that will help set the groundwork for this group. The forum will provide professional lectures on how to optimize business practices, organize content for specific businesses, and create the structure that will allow for the women to teach their own experience to other businesswomen. As of now, Jindas has brought together twenty women to begin the group, and since its initiation, fifteen more women have expressed willingness to join. The first official meeting will be held on January 10th, and more will follow on a regular basis.